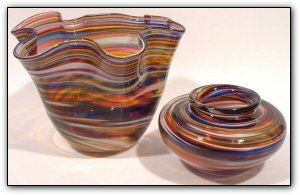 These bowls are from the Sunset Series and feature a swirling mix of colors. This matching pair contains one fluted bowl and one straight bowl. The fluted bowl measures 9" wide x 8" tall and the straight bowl measures 6" wide x 3.5" tall.